Today marks the 30th anniversary of one of the most infamous tragedies in Santa Clarita history. 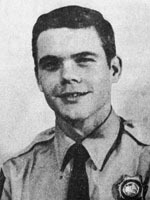 Around midnight on the night of April 5, 1970, four young California Highway Patrol officers were gunned down by two wanted criminals in what is considered to be the worst massacre in the 71-year history of the CHP. The incident, which unfolded just before midnight on a Sunday, began with a call to the CHP from a man claiming that two men had waved a gun at him and threatened his life after a minor traffic collision on Interstate 5 near Gorman. 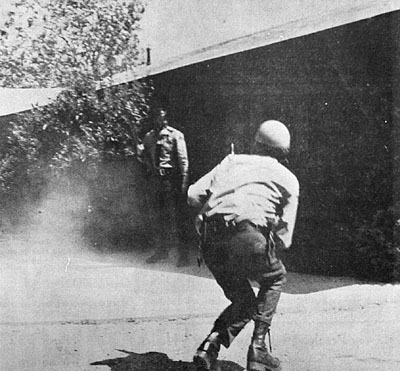 Officers lob tear gas into the home on Pico Canyon Road in which suspect Jack Twinning was hiding. Twinning was later found dead in an apparent suicide. Officer Walter Frago and his partner, Officer Roger Gore, both 23, responded to the call and quickly located the vehicle described by the victim. Officers James Pence and George Alleyn, both 24, radioed that they would provide backup. It is not known whether the two gunmen, who were wanted for murder in Oregon, pulled over voluntarily or were forced to pull over by Gore and Frago in the parking lot of J's Coffee Shop at the intersection of Interstate 5 and Henry Mayo Drive. The details of the events that followed are unknown. All four officers were shot and killed that night, leaving behind four young wives and seven small children. Gary Kness, a Saugus resident, witnessed the shooting from his car. 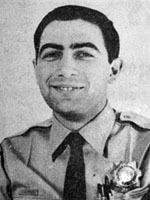 Kness ran up to assist the wounded officers and even fired shots at the unseen suspects with one of the officer's handgun. Kness escaped unharmed. At the time, authorities said that the two suspects, identified as Jack Twinning and Bobby Augusta Davis, were planning to rob a number of Southern California banks. The two escaped in their vehicle, crashed into an embankment and fled on foot into the hills. Davis attempted to steal a camper, but was shot several times by the owner. He was then taken into police custody. Twinning ran through the hills until he came upon the home of Glenn Hoag on Pico Canyon Road. Twinning held Hoag hostage in his home for several hours before releasing him at 9 a.m., Monday morning. Dozens of law enforcement officials surrounded the house, waiting for Twinning to surrender, when they heard a single shot. They proceeded to pour tear gas into the house, but Twinning did not exit the house. Authorities then entered the house with gas masks. One deputy encountered Twinning in a hallway and they exchanged gunfire. A few moments later, Twinning was found dead, presumably by his own hand. 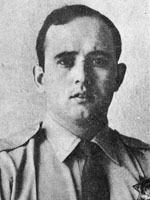 Davis was later convicted on four counts of murder and sentenced to life in prison. According to Doug Sweeney of the California Highway Patrol station in Newhall, the CHP currently uses this incident as a vital part of its training procedures. "We use it in all of our academy training," said Sweeney. "It was one of the turning points in training for officer safety. It is used as an example of what to do and what could have been done better." Four cypress trees were planted in front of the Newhall station in memory of the slain officers. A memorial plaque near the trees bears the names of the four young officers who lost their lives in the line of duty. 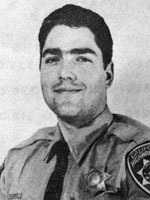 A memorial service will be held Friday (April 7, 2000) at 1:45 p.m. at the Newhall CHP station in honor of the officers.